How to get my hover-menu back? What happened with the menu that comes if I hover over my username in the top-bar? It was one of the most used feature on Stackoverflow since I've used it regularly to get a quick overview over my recent activities or reputation changes. Is it possible to get it back somehow? There are a few steps to reproduce your favorite popout. Who knows how long it will be around server side though. The styling is from a user script. The new top bar was designed with the goal of simplifying and bringing forward things that 90% of our users are interested in, and then we took a second pass looking at this from our very active users to make sure that we weren't screwing up your workflow. Basically, we determined that nobody was using the week and month columns and the revisions and favorites rows didn't make sense. There was a lot of discussion around the votes cast... It appeared to be used infrequently, but it looks like it was a few users using it frequently instead of a lot of users using it infrequently. The menu isn't coming back, but I think the activity link and votes cast today are legitimate gripes that I'd like to work with you to see if we can come up with another solution. I'm roughly considering either making the achievements header link directly to the activity tab or renaming the achievements drop-down to activity and having the same behavior. With respect to votes cast, I'd like to find someplace else to put that. Not the answer you're looking for? 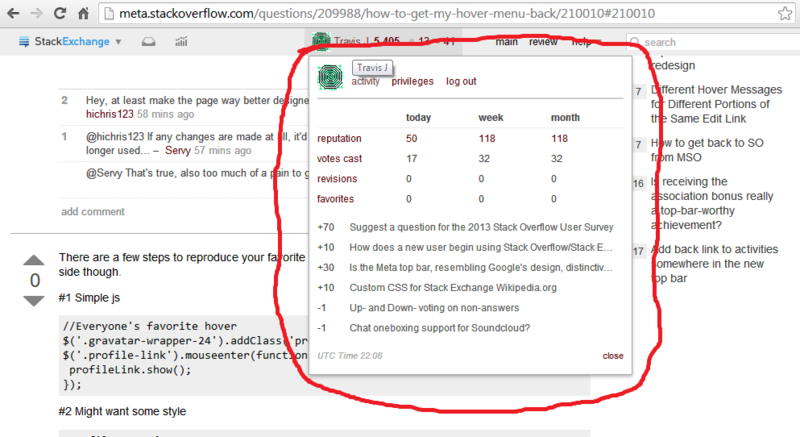 Browse other questions tagged feature-request support tooltips top-bar . I want my vote hover/popup back on the top bar! How can I see how many votes I have left for the day? Is anyone else personally terrified of the new bar at the top? 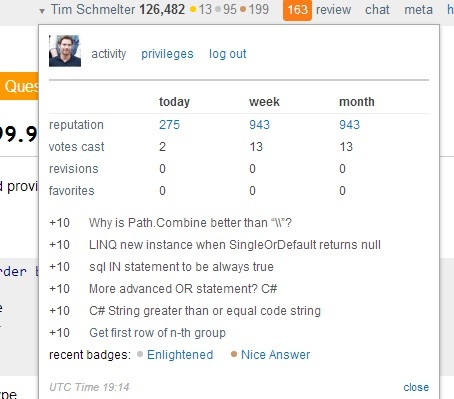 How do I find the privileges I have earned and will earn in Stack Overflow? Can more of the functionality of the old envelope be added to the new drop-down menu? Who ate my rep changes on Area 51 (again)?